Goldie Shop is exclusively focused on sourcing a fresh and beautiful mix of jewelry and women's accessories and bringing it to you in one easy location. We aim to have a variety of prices to meet all of your gift giving needs. Rachel began her career as an Assistant Buyer for a Federated Department store in New York City. She worked for Martha Stewart and The Wedding List in Boston, before transitioning to Interior Design. She ran The Design Shop on Charles Street in Beacon Hill and worked as a Design Assistant. After marrying her husband they moved back to the New York area to start a family. She took over the buying and store development for Cape Resorts Group in 2007 developing Tommy's Folly in Congress Hall Hotel in Cape May, NJ and most recently The Dock Shop at Baron's Cove Hotel in Sag Harbor, NY. Rachel's love of interesting and beautiful jewelry and accessories prompted her to start her own business. She created Goldie as on online shop to find just that. Goldie Shop will also be hosting trunk shows and Sip and Shop nights in addition to the digital shop. "Goldie" is named after her husbands grandmother, Goldie Elvgren, who was the mother to the famous pin-up artist, Gil Elvgren. 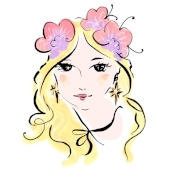 The Goldie Girl logo was painted by British Fashion Illustrator Susannah Garrod.